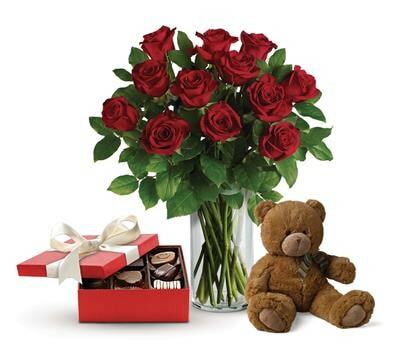 This lavish gift set includes a gorgeous vase arrangement of twelve long stem red roses, accented with greenery, plus chocolates and a delightful bear. Flowers and gift items are subject to seasonal and regional availability. In the event that any of the flowers or gifts are unavailable, the florist will substitute with a similar item to the same value. Stem count, contents, packaging and container may vary. Chocolates and soft toys are subject to availability, if the pictured items are unavailable, they will be substituted with similar items to the same value. Packaging may vary.